Above, Msgr. Sean G. Ogle, pastor, is surrounded by the students. On the left side: Deacon Ruben Mendez, Father Wlad Kubrak, parochial vicar, and Father Joseph Pham, retired. On the right side: Father Peter Nguyen, parochial vicar and religious education program moderator along with the teachers: Stacey Bravo, Sally O’Connell, Gina Caridi, Fatima Garcia, Elaine Rodriguez and Nelly Gutierrez, director of religious education. 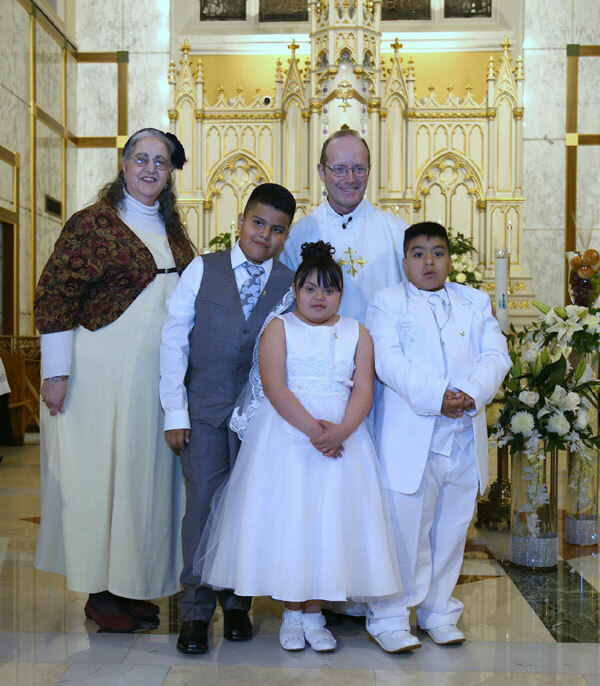 Among the 78 children were three First Communicants from the special ed program, left, with teacher Louise Walton and Msgr. Ogle.